Avelino Vieira (blue) scores for Peterborough Sports in their 4-1 FA Cup win at Wisbech. It’s Wisbech Town’s turn to try and de-rail the Peterborough Sports express tonight (October 4), but forgive them for travelling to the big city full of apprehension. The Fenmen have already met Jimmy Dean’s all-conquering side twice this season and they’re currently 7-1 down on aggregate after following a 4-1 FA Cup defeat with a 3-0 United Counties Premier Division reverse. Josh Moreman (blue) in action for Peterborough Sports against Wisbech in an FA Cup tie. Sports manager Jimmy Dean is hovering in the background. And both of those matches took place at the Fenland Stadium. The big return game in the Premier Division is at PSL tonight (7.45pm), a venue where Sports have won their last 26 matches including every single league game in Division One last season. Sports last dropped points at home on January 24, 2015. Sports will therefore be warm favourites to maintain their three point lead at the top by winning their 10th match (out of 11) of the campaign, but their sole defeat did arrive in a derby when Deeping Rangers prevailed 1-0 at Outgang Road. 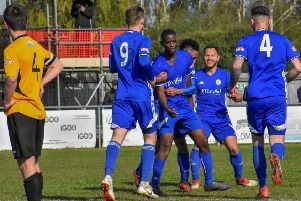 Second-placed Eynesbury are at home to Wellingborough, third-placed Desborough travel to Kirby Muxloe, while fourth-placed Holbeach United have to wait until tomorrow (October 5) to face in-form Yaxley at Carters Park. Holbeach lost a Premier Division match for the first time this season at the weekend when Desborough pipped them 2-1. Yaxley have won their last four matches and have bolstered their ranks with the signing of Joe Butterworth - son of former Posh player-of-the-year Garry - a player who started the season at Whittlesey Athletic. Holbeach did win 1-0 at Yaxley earlier in the season. Peterborough Northern Star are at Huntingdon tomorrow. Bourne seek back-to-back home wins in Division One when Thrapston visit the Abbey Lawns. Struggling Blackstones, and their glut of new players, entertain second-placed Oakham tomorrow. Deeping Rangers tackle Sleaford in an all UCL Premier Division Lincs Senior Trophy game at Outgang Road tonight. Peterborough Sports v Wisbech Town. Bourne Town v Thrapston Town. Deeping Rangers v Sleaford Town. Huntingdon Town v Peterborough Northern Star.